The mythology of hope and change is often assumed to be THE great American myth. Pioneers taming the wilderness, making the world better every day in every way and eventually, perhaps, creating a Kingdom of God on earth, leading the whole world to endless progress or ultimate redemption: What could be more American than that? But a second mythology, less often noticed, has been intertwined with the first from the very beginning of white immigration to the British colonies of North America: the mythology of homeland insecurity. The founders of Jamestown in 1607 chose the site largely because it was almost completely surrounded by water. To reinforce their sense of security they built a wooden fortress to surround their settlement. Their certainty that they were planting civilization inside their fortress, while savagery was kept outside its wall, was another way they struggled to keep their insecurity at bay. Ever since, boundaries — natural, constructed, and imaginary — have served not only to demarcate the frontier being pushed ever further into the west and the future, but, equally importantly, to protect against the threatening forces that were believed to lie beyond the frontier in every direction. The oceans, rivers, mountains, and deserts were not only challenges for Americans to cross, driven by the hope of creating change. They were also bulwarks to prevent others from invading the American homeland and to prevent the fear of invasion from overwhelming the nation. Boundaries were drawn on maps and guarded by armed men for the same defensive purposes, as were symbols of imagined demarcation, from the churches of the earliest colonial settlements to the nuclear “umbrella” and the Star Wars “shield.” All were depended on for security. Before exploring the mythology of homeland insecurity, let’s briefly consider the very idea of security. Security is never an objective thing, like a rock or a telephone. What looks like a secure situation to one person or nation can look very insecure to another. Is insecurity, then, just a subjective feeling, an emotion? Insecurity may surely generate anxiety and other emotional responses. But it may not. For example, when pollsters ask, “Do you expect the U.S. to be struck again by terrorists?” some sizeable number of respondents will say “Yes.” Yet few of those people are likely to have sweating palms or a faster pulse rate at that moment, much less all the time. The basic sense of insecurity — the one they carry around all the time — is not an emotion. It is a judgment about their situation, a belief, an attitude, a point of view. If the judgment seems certain it becomes a conviction, and then it may very well function as if it were an immediate perception of an objective reality. Although everyone is ultimately free to form their own judgments, views on large societal issues are hugely influenced by the culture in which we live. They are shaped by, expressed in, and sustained by the prevailing national myths. Certainly, our sense of national security and insecurity is shaped by the web of myth that our culture weaves into our lives. The further away the purported danger, the more true that is. If my house is on fire, I don’t need cultural forces to tell me I’m in danger. But suppose I’m convinced that some people in a mountain hideout on the other side of the world are plotting to set my house on fire, or to destroy my way of life. Unless I’ve seen and talked with them directly, that conviction comes solely from the mythic images that my culture provides. The culture of the colonists, though filled with hope for positive change, was also pervaded by mythic images of insecurity. People who saw themselves as fundamentally secure were not likely to leave Europe. For most of the early emigrants, there was obvious danger as well as opportunity in coming to a land imagined as surrounded on three sides by wilderness and savagery, while from the fourth side, in Europe, colonial powers vied for control of North America. In the first decades after the United States was born, perceptions of danger continued to shape the national experience. Along the frontier, territorial expansion inevitably triggered conflict with native peoples, who served as the primary representation of threat to individuals and communities. Thus the frontier was well fortified and its white residents were heavily armed. Closer to the seaboard, there was a widespread fear that the very existence of the nation was threatened by foreign enemies — Spain, France, and most commonly England. Every early president, in his own way, contributed to a growing tradition of a proud, resolute foreign policy dedicated to keeping the nation’s borders inviolable. The War of 1812 gave a powerful boost to this tradition and pride. Yet British conquest of the U.S. was still feared in some quarters as a real possibility through the 1840s. The end of the Civil War temporarily laid to rest doubts about the nation’s survival. Within a few decades the threat from native peoples had ceased, too, though insecurity was heightened by growing nativist fears of the many foreigners flooding to America’s shores. But by the end of the 19th century, as the U.S. began to play a greater role in international affairs, the nation’s life seemed again entangled in a world of dangerous conflict. The “redeemer nation’s” rising vision of global mission and its rising military (especially naval) might could hardly avoid breeding a sense of insecurity. At the outset of the 20th century, war in the Philippines made it vividly clear that the frontier might now appear anywhere in the world, seemingly overnight, calling for resolute defensive action. Woodrow Wilson is best remembered for his devout of expressions of hope that American participation in World War I would insure a far better, perhaps millennial, postwar world of universal democracy. But a central part of his vision was a world of national borders everywhere kept inviolable. And his rhetorical campaign to foster public support for the war effort relied heavily on apocalyptic warnings: A German victory would spell the end of the American way of life, which would mean (and here Wilson merely repeated a staple of the nation’s mythic tradition) the end of civilization itself. National insecurity — fears for the nation’s existence — spiked rapidly during World war I. Then the fears abated just as rapidly and seemed quite distant for the next two decades. Of course, there was still plenty of evidence of insecurity, including (among others) poverty-stricken farmers, white supremacist vigilantes, organized criminal syndicates, striking workers and the forces that suppressed them, and ultimately the Great Depression, bringing disillusion and its anxieties to nearly everyone. On Inauguration Day, 1933, Franklin D. Roosevelt warned not merely of fear but of a “nameless, unreasoning, unjustified terror” haunting the land, and he promised to make sure that America defeated both the terror and the Depression just as it had defeated the Germans. During his first term in the White House, FDR did much to help the nation recover its confidence that democratic capitalism would survive. By the middle of his second term, though, the focus of public anxiety was shifting toward Europe, where another war seemed a growing possibility. When FDR was quoted in 1939 as saying that America’s frontier was now “on the Rhine” it was a fairly accurate paraphrase of what he told some senators privately. [ii] But the resulting public storm forced him to deny he ever said it. Few Americans could yet imagine, much less endorse, sending their sons to fight another foreign war. Roosevelt’s most lasting accomplishment — even more influential than the changes he wrought in domestic policy — was to change foreign entanglement from unthinkable to inevitable in the nation’s mythic life. By December 7, 1941, even the most diehard anti-interventionists were likely to accept the necessity of war in Europe as well as the Pacific. FDR’s masterful rhetorical campaign made every other option seem irrelevant. “We Americans have always wanted what’s best for ourselves and for the world. Our national policies have never intentionally aimed to hurt anyone. Yet we have enemies who want to destroy us, our way of life, and civilization itself. The threat is apocalyptic in magnitude. Since nations are now interwoven in a global network of relationships, we are open to attack everywhere. The world has become an endless reservoir of potential enemies. “Our own policies played no role in generating these dangers. Our enemies are motivated by irrational impulses we can never understand. So we cannot conciliate our differences with them. Since our own policies bear no responsibility for their acts of resistance, we have no reason to reconsider our policies or look for alternative approaches. The only thing left to do is to resist our foes, using violence when necessary. This was Roosevelt’s public myth. Privately, among policymakers and elite leaders, he endorsed the economic and geopolitical paradigm most often called liberal internationalism, which came to dominate U.S. foreign policy during his presidency. Though liberal internationalism was a broad and complicated movement, its main thrust was to demand a single, unified global capitalist marketplace braced up by more or less democratic political systems everywhere. Ultimately it was — and remains today — a mythic vision: America would lead the great capitalists powers in creating and then guaranteeing the continued existence of this global system. In this narrative, security means imposing a substantial degree of American economic and geopolitical control all over the world. The euphemistic code words for this goal of control are security and stability. If we achieve stability everywhere — if no one can challenge our “vital interests” anywhere — then we can live at peace. “Peace and security” and its synonym, “peace and stability,” are the mantras of American foreign policy. All manner of violence seems acceptable as long as it serves this goal. Of course this privately circulated myth, when enacted in policy, is very likely to generate resistance in various parts of the world at various times — places and times that prove to be unpredictable. The cycle of conflict and the need to be constantly on guard are inescapable. So it is no accident that the modern obsession with national security was born in the same era as liberal internationalism. They were conjoined twins; the same historical process gave birth to both and made them inseparable. The private mythology of national security is, even more than the public, actually a mythology of national insecurity. Thus, while Roosevelt was intentionally bringing the nation a feeling of freedom from fear in some respects, he was at the same time, albeit unintentionally, laying the foundations of a fear-based culture that would endure long after he was gone. The tears of mourning for FDR were hardly dry when the American news media reported that a terrible new weapon, exploded over Japan, might some day be used against the United States itself. Fear of nuclear holocaust was soon attached to an overwhelming fear of the Soviet Union; yesterday’s heroic ally became today’s monstrous enemy. Soon millions of Americans felt the fear of internal communist subversion that we call the McCarthyite witch-hunt. By 1950, when the U.S. “police” effort in Korea received almost universal approbation, it was clear that Roosevelt’s mythology of national insecurity, though developed to address one particular set of enemies, was not tied to that set. It could be successfully transplanted to interpret any foe or any danger that seemed to threaten on any new frontier, foreign or domestic. In 1953 the new Republican president, Dwight Eisenhower, embraced the Democrats’ doctrine of containment. By this time the Rooseveltian vision of a unified, global capitalist system was well on the way to being realized, at least in the “free world” where that system prevailed. The logic of liberal internationalist discourse dictated that change of any fundamental sort in “the free world” should be resisted, because the risks of fundamental change were so terrifying that they outweighed its benefits. Ike told aides that he aimed to build an impermeable “dike”[iii] around the communist bloc. Change can never be escaped, though, as Eisenhower acknowledged when he proclaimed that the U.S. faced “not a moment of peril but an age of peril.” For eight years he kept up his warnings of impending, communist-initiated nuclear catastrophe. Cold war fear was now “the new normal,” one of his staffers wrote, [iv] echoing his boss’s premise that the peril could never be ended. The only option Eisenhower offered was to impose enough control over the nation’s foes to manage apocalyptic threats forever. His policy of containment — I have called it “apocalypse management” — was more truly intended to create a “dike” that would surround the “free world,” and especially America, on every side, to maintain its status quo in the face of any and all threatening changes. 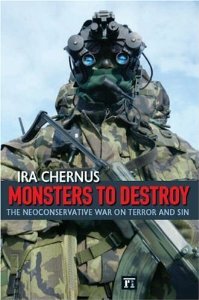 Ironically, though the liberal internationalists had defeated the anti-interventionists (the so-called “isolationists”) and their policy of “fortress America,” it was the liberal internationalist policy of containment that effectively turned America into a mythic fortress, sheltered behind walls of symbolic safety on every side. Eisenhower’s version of the mythology of national insecurity crystallized a defensive and conservative stance that became the dominant pattern of U.S. foreign policy discourse throughout the cold war era. Ike’s political success made it clear that his version of the Rooseveltian story would have bipartisan support. Indeed, John F. Kennedy charged that the Republicans were not taking the permanent threat seriously enough, that the United States now faced its “hour of maximum danger.” To confront that danger, he ordered a massive increase in the U.S. military arsenal and the dispatch of more troops to Vietnam, where the line encasing the “free world” seemed most vulnerable. Lyndon Johnson turned the Vietnam mission into a full-scale war, because the alternative seemed too frightening to contemplate. With that decision, he set in motion events that would briefly tear away America’s mask of confidence and reveal the political, social, and cultural chaos simmering beneath the surface. Political-cultural movements and trends that were not based on fear flourished briefly during the Vietnam war years, but they never took hold as dominant trends. The public affirmed the mythic narrative of insecurity again in full force on September 11, 2001. George W. Bush articulated the nation’s dominant assumptions when he promised to “hold the line” against an apocalyptic threat with no foreseeable end, a threat that would destroy the nation, and indeed the whole civilized world, if America did not stand steadfast against it. To that end he created a new Department of Homeland Security — which might be better named the Department of Homeland Insecurity. Barack Obama’s support for the rapidly growing Department and for so much of Bush’s “anti-terrorism” campaign is the clearest sign of continued bipartisan support for what is now best termed the mythology of homeland insecurity. The triumph of this mythology since the 1940s has had profound effects on American culture and on politics in the domestic as well as foreign arenas. It is no accident that, with the exception of those few brief years of the Vietnam war era, the political trend has moved decidedly toward the right. No matter what the issue, we ask our elected officials, above all, to protect us from dangerous change. As Maureen Dowd has written, “Every election has the same narrative: Can the strong father protect the house from invaders?” — invaders, she might have added, who lurk everywhere and aim to burn the house down. That has indeed been the dominant question of every presidential election since 1932; since 1940, the invaders have most commonly been identified as armed foreign forces. But the name of the enemy is a secondary matter. It might any feared people: communists, terrorists foreign and domestic, immigrants, drug dealers, “hippies,” “the religious right,” etc. It might be, not people, but abstract forces: totalitarianism, economic disaster, crime, “big government,” secular humanism, bigotry — the list is potentially endless. The mythology of homeland insecurity requires only the claim that someone or something endangers — and will always endanger — the very existence of the nation. This mythology dictates that America’s primary task is not to create a millennial transformation or, indeed, any fundamental positive change at all. Rather, the task is to stand firmly united, forever, against the dreaded foes; to safeguard the existing global system, one way or another, against any forces that might create fundamental change. Peril and uncertainty now seem to be the basic, enduring foundations of the nation’s life. [iii] Ira Chernus, Apocalypse Management: Eisenhower and the Discourse of National Insecurity, 83. [v] Gary Dorrien, Imperial Designs: Neoconservatism and the new Pax Americana, 30, 38. [vi] Thomas L. Friedman, “A Manifesto for the Fast World,” New York Times Magazine, March 28, 1999, 42; idem., The Lexus and the Olive Tree, 373. I do not dispute the peculiar expression of the myth in the American context, but I wonder that the fear of others (strangers, eccentric, foreign, deviant) is not a normal fear. I remember that English villagers sometimes attacked travelers who wandered into their villages, especially night visitors. I think of how terrified neolithic aboriginals are of most encounters with aliens. So how is the American fear expressed differently? How is it culturally important, and so important that it defines us in a manner that is significant? I am an American, and these essays are concerned only with what has happened, and is happening, in America. Even if many other societies had the same pattern of insecurity, it would still be just as important for us Americans to understand our own nation’s political culture as thoroughly as we can. Each society has its own unique pattern of insecurity that needs to be understood on its own terms. My goal is merely to contribute a little bit to that particular understanding. America’s homeland insecurity is different from English villagers or neolithic people because ours is articulated in the context of the modern nation-state. It is not merely fear of what might happen to individuals. It is fear of the extinction of the nation-state. That’s a particular pattern that deserves to be studied on its own terms. We can see it in other nation-states; for example, the old Soviet Union, Israel, and no doubt others that I’m not so familiar with. America’s homeland insecurity is unique because it arose in interaction with America’s mythology of hope and change, which many historians have seen as quite distinctive, perhaps even unique, among nation-states. The importance of homeland insecurity stands out most clearly when we see its contrast with “hope and change,” and recognize that since the late 1930s homeland insecurity has dominated over “hope and change” in the mainstream political culture. That particular dynamic is unique to America.